Tomoko Sawada’s ID400 (1998) was produced while she was a university student and living in Kobe. 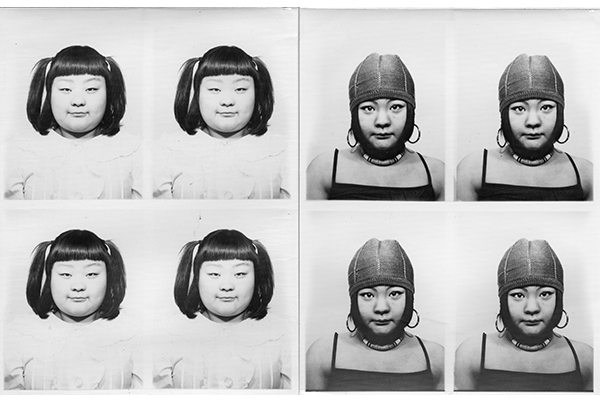 “The photo machine, a small vending machine-like contraption, can be found in numerous locations around the city.” Sawada spent weeks changing her physical appearance with make-up, clothing, and hairstyles, creating 400 different identities using a machine whose sole purpose is to produce stable images for official documents. The facial characteristics are so varied that the photographic project becomes a compelling study of physiognomy. Born in 1977 in Kobe, Japan, Tomoko Sawada lives and works in Kobe and New York. She is the recipient of the Higashikawa Prize in 2008, photo-eye’s Best Books of 2006, the Bleue Mer Award in 2006, and the ICP Infinity Award in 2004. She has exhibited extensively, including at the Andy Warhol Museum in Pittsburgh (2012), the Joan Miró Foundation in Barcelona (2008), and the Museum of Modern Art (MoMA) in New York (2005). Her works are in major public collections, including the National Museum of Modern Art in Kyoto, the Maison Européenne de la Photographie in Paris, MoMA, and the International Center of Photography in New York. Sawada is represented by MEM Gallery in Tokyo.